One of the key built-in (embedded) capabilities in all IRI data management products is report generation. Reporting is typically done through SortCL programs in the IRI Voracity platform or IRI CoSort product. Its users performing big data transformations can also generate one or more custom-formatted detail and summary reports in the same job script and I/O pass; i.e., they run BI directly with ETL! And because IRI NextForm (data/DB migration), IRI FieldShield (data masking) and IRI RowGen (test data) also leverage SortCL capababilities, they too can generate many of the same kinds of reports using the same metadata. Structured data (database or flat file) sources are well supported, as are many forms of semi-structured and unstructured data. There are no limits on the number of sources or targets. See this list of supported data sources, and this diagram characterizing the flow of data. Define report specifications in a text editor, or wizards in the Eclipse GUI for all IRI software, IRI Workbench. Run reports from the command line, batch scripts, the GUI, or applications (as a system or API call). Get reporting with high-performance data integration, data migration, data masking and test data generation at the same time by formatting your targets in the same job script and I/O pass. Get most of the same data manipulation and reporting features of SQL and ICE-TOOL, but with more speed, simplicity, and interoperability. Simultaneously visualize analyzed data with BIRT or Splunk, and prepare data for cubes or other BI and analytic tools. What Other Reports Can I Produce? And If I Need More Capability? Activities in IRI software help third-party analytic & BI tools visualize your data faster. 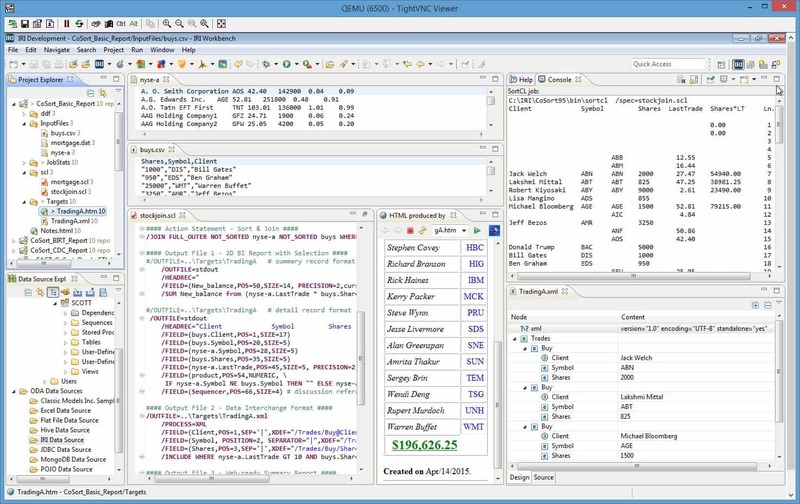 Or, run IRI data preparation jobs seamlessly with BIRT reports you design in the IRI Workbench GUI, built on Eclipse. * IRI's FieldShield (data masking), NextForm (data migration), and RowGen (test data generation) products are spin-offs of the CoSort SortCL program and included capabilities in the Voracity platform. For that reason, they can produce the same kinds of custom report layouts.